I am pleased to announce the autumn issue – and what will be my last edition as Editor – of Panlibus is now available online. This issue has a public library focus, but as always includes something for university and college libraries. We have recently reported on both the future of public and academic libraries, so this issue we continue the series by looking at the future of librarians and preparing librarians for the future (p.14). The Welsh Information Literacy Project is entering its fourth phase following the successful initial three phases. The honour of progressing the fourth phase has been awarded to the North Wales Library Partnership and Coleg Llandrillo. Siona Murray gives us the inside track on phase four. The Reading Agency has been leading on many incredible projects over the years all borne from a series of ‘what if’ questions. Miranda McKearney, in her last Panlibus article before her well-earned retirement, provides an overview of some of those innovative projects. Edinburgh Libraries has long been a beacon of success for public libraries, but it wasn’t always thus. We look at what changes Edinburgh have undertaken over the past few years to now fly the flag for public libraries. We also have articles demystifying cloud computing libraries, exploring Bradford College’s plans for their new library and a case study from lorensbergs. It has been an honour and a privilege to have been the editor of Panlibus for nearly four years, and thank you all for your support of Panlibus throughout its existence. I hope you enjoy this issue, and as always, I encourage you to get in touch with your thoughts on any of the articles. If you have any topics you would like to share with the library world, our new editor would be extremely pleased to hear them. Please contact them on libraries-panlibus@capita.co.uk. The latest issue of Panlibus Magazine is available to read online today. Technology and libraries have always gone hand in hand and with the two becoming increasingly entwined, this issue offers an array of views and opinions from many prominent voices in the library technology community. Brian Kelly from UKOLN (p6) notes that rapid technological developments, combined with the financial crisis, will transform the nature of the services provided. 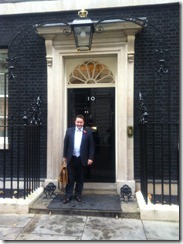 Brian gives his technological predictions for 2012 and describes approaches for planning for the future. Peter Kilbourn of Book Industry Communication (p4) believes that technology can be used to protect the best of the library tradition and exploit the existing network of buildings, but in a way that doesn’t put pressure on rapidly dwindling funds. The emergence of mainstream cloud computing over the last couple of years has prompted libraries to ask how this will affect them and what benefits it will bring. Erik Mitchell, a prominent figure in the world of cloud computing in libraries, discusses its impact and offers some guidance on balancing the issues and implications when evaluating cloud for libraries (p14). 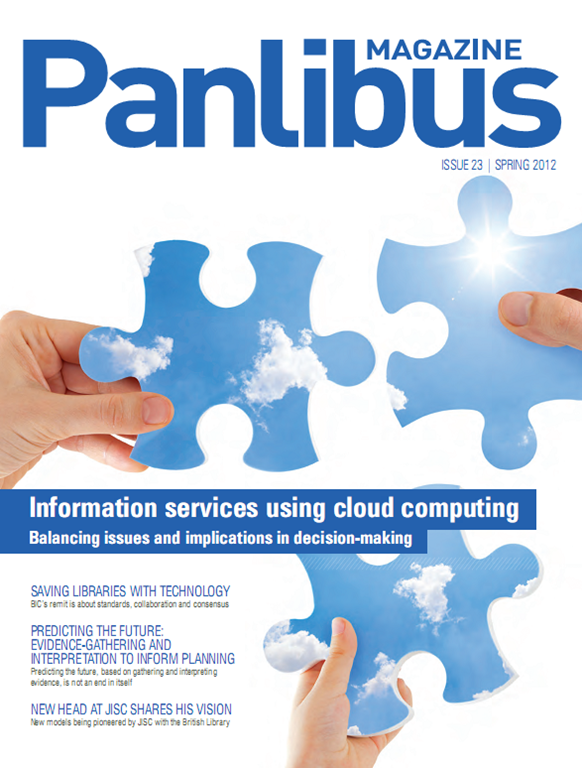 We also take a look at some of the practical applications of cloud in use in libraries currently (p8). Capita’s Additions Partners provide a wide range of technology designed to improve your library service. 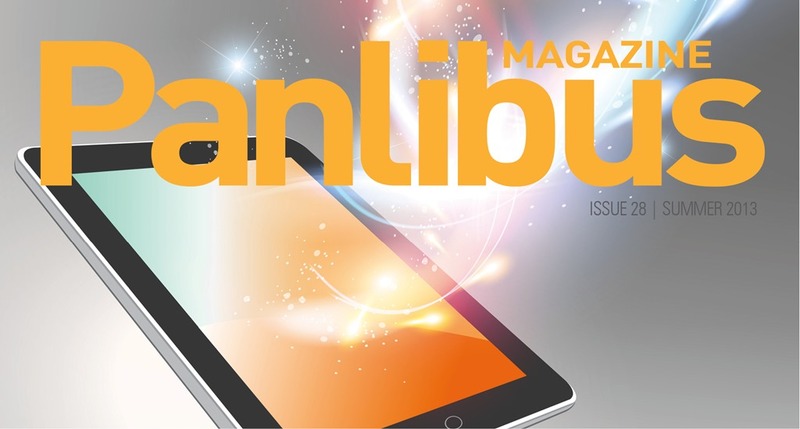 In this issue we have articles from 3M, introducing SIP 3.0; Edinburgh libraries and Solus, outlining how they together achieved significant growth for the virtual library; and PSP Security Protection, introducing themselves to the Panlibus readers. Subscribe to receive your own hard-copy or online version. Thank you to all who filled out our recent survey. The answers have all now been collated and are being analysed. One of the things that has come out so far is introducing a ‘letters to the editor’ page which I am very keen to introduce. 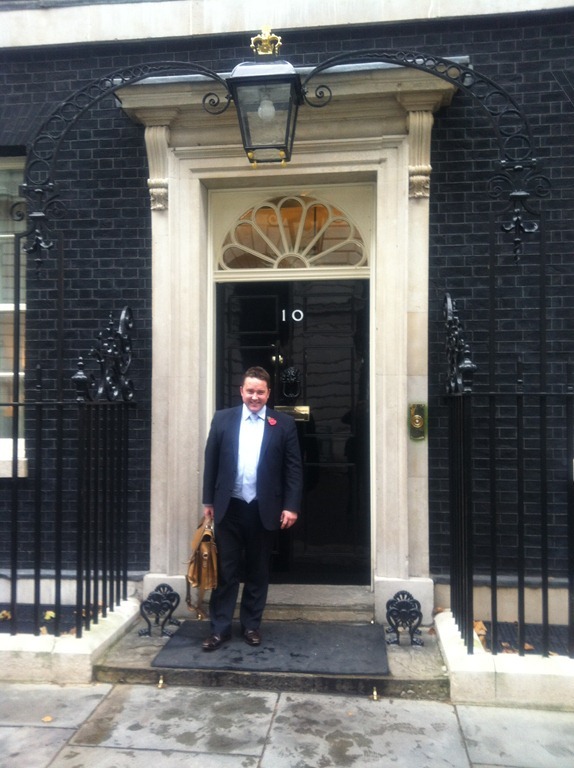 If you would like to send a letter for publication please email me at mark.travis@capita.co.uk. Finally, the winner of the survey prize draw is Helen Standish from Manchester Metropolitan University, who takes home a Kindle. Congratulation to Helen. For years libraries have been under increasing pressure. Faced with static or falling visitor numbers, budgetary constraints, competition from “stack ‘em high, sell ‘em cheap” retailers and etailers, and the rise of the ereader, commentators have long predicted their demise. Rather than roll over and accept this, the City of Edinburgh has chosen to harness the very technology cited as a threat and engage with new audiences in new ways. The primary aim has always been to attract physical users to their facilities, however if this is not possible then the next best thing is to engage digitally with their audience. If you think about citizens in a new way, as mobile, digitally accessible, yet unique and focused on receiving the service that they want whenever they want it, technology gives them and you the opportunity to build a new relationship. Once in place, it also enables you to market your services free of charge, increasingly important in these austere times. Liz McGettigan, Library and Information Services Manager at the City of Edinburgh Council realised the requirement to engage with developments in web 2.0 services, or risk being left behind in an increasingly digital world. She saw the opportunities for promotion that social media enabled and created a team of people within the library to pull all electronic resources into one location. Finally she employed the best technology available to engage with Edinburgh’s citizens, in facilities, on the web, socially and on the go. Libraries now lead the way in Edinburgh, with other departments continually looking to implement their successful strategy. SOLUS has also fully integrated with Capita’s LMS to provide functionality for “Your Library App” and this has enabled additional benefits. Most recently added and most popular stock can now be automatically promoted across other platforms managed by SOLUS, such as digital signage and social media. To take advantage, access must be 24/7, slick and with instant gratification. V2 of Edinburgh’s Library App will allow users to scan a barcode in a shop and automatically search the library catalogue. This is already reality, the recently launched Haringey Library App which is powered by SOLUS allows users to scan, search and reserve within seconds. If they don’t know how to get to the reserved item, the app will take them there and if an Ebook is available, users can get that instant gratification! Of course, the proof is in the pudding and Liz McGettigan has solid evidence to prove this innovative use of technology is working. In the last year digital visits have increased by 135,000, PC usage is up by 145,000 sessions, attendance at events has increased, up 32% and significantly, the decline in physical visits has been reversed with an extra 30,000 people attending libraries. Wishart stated, “it’s a classic case of inbound marketing, where effective online positioning has a direct impact on offline behaviour. It’s fantastic for Liz to be able to report back to her stakeholders that she has improved access to services and achieved a direct return on investment, both in relation to time and money.” Success has also culminated in national recognition with the efforts of Liz, Jim and the team bringing a shortlist for the www.ukpublicsectordigitalawards.co.uk2011. See more from Solus and Edinburgh Libraries later this week at EDGE 2012. Capita was proud to be invited to the launch of this year’s Summer Reading Challenge at the House of Commons, which this year has the theme ‘Circus Stars’. The Summer Reading Challenge which is run by independent charity The Reading Agency, along with libraries across the UK, is the biggest and most successful reading promotion for 4-11 year olds, encouraging all children who take part to read at least 6 books over the summer holiday. The event was bustling with some of the nation’s best loved authors, along with MPs, councillors, publishing industry figures, librarians and library campaigners. As Miranda McKearney, Director of the Reading Agency explained, this year’s challenge will be the biggest ever, with 97% of local authorities and 3000 young volunteers taking part. Miranda made the point that libraries are in the serious business of making reading fun and the sad fact is that only 40% of children enjoy reading. Research carried out by the UK Literacy Association shows that participating in the Summer Reading Challenge combats the ‘summer holiday dip’ in pupils’ reading motivation and attainment, and boosts their desire to read at home. Greta Paterson, Head of Children and Young People Services at East Sussex County Council, told me “It’s a fantastic way to connect with young readers, it gets library staff into schools and we see children in the library that we perhaps wouldn’t see otherwise.” The enthusiasm and energy of the people that are directly involved with making the Summer Reading Challenge a success was apparent, as was the mood of optimism and determination despite the tough financial times some library services are facing at the moment. Voicing his support for the event, Nick Gibb, Minister for Schools described the Challenge as a “pivotal part of the educational reform” that the government is undertaking and revealed that 1 in 5 eleven year olds currently leave primary school without being able to read. He pledged that every child should be able to read by the age of six, a goal which the government has started to work towards. A highlight of the event was a few words from acclaimed children’s author and Patron of the Summer Reading Challenge, Michael Rosen. He talked enthusiastically about the value of libraries, which he described as “a treasure trove of the world’s wisdom, there for free”. He also stressed the importance of what he termed “book learning”, even in (or especially in) this age of the internet. And if the future success of the Summer Reading Challenge wasn’t already in the bag, Ruth Mackenzie, Director of the Cultural Olympiad, announced that The Reading Agency have been selected to be part of the London 2012 Festival. The Reading Agency will be working with libraries all over the UK to stage a huge reading extravaganza and to, as Ruth put it, sprinkle some “Olympic magic dust in every library”. Sounds good to us. At a time where libraries face an uncertain future, stories of how libraries are being used to reach out to vulnerable people and bring together communities are greatly welcomed. Arguably the biggest accolade of libraries affecting their community is CILIP’s prestigious “Libraries Change Lives Award”. In its 20th year, the Libraries Change Lives Awards provides a home to celebrate innovative projects across the country, such as: Bookstart, a project run by Sunderland Libraries and Booktrust and Across the Board: Autism support for families, run by Leeds Library and Information Service. This year’s award was announced at Umbrella and won by Kent Libraries and Archives who ran the Making a Difference project. The Making a Difference project began with Kent Libraries working closely with the local district partnership to provide a venue, and a wide range of activities, for a group of adults with learning difficulties to socialise and to relax. The library worked in collaboration with partners that include statutory organisations, charities and volunteers. Carers were able to deliver regular Biblio Hour events, large themed evenings such as “Putting On the Ritz” (a 1920’s fashion evening), and a number of volunteering and work experience opportunities. One of the work experience opportunities arose when Communities Future Kent met a mystery shopper service called Shopper Anonymous Kent. At the time there were no persons with learning difficulties on their books, but through the work with the library, Graham Seymour, the Managing Director provided training to the group. From there, eight trained mystery shoppers have visited most of the major libraries in the west of the county to provide advice how to improve the inside and outside of the library. The result was that a number of adults with learning difficulties were employed by the library and Easy Access collections of stock, chosen by adults of learning difficulties, being placed in town centre libraries. So far, 721 adults with learning disabilities from across the county have taken part in library activities since April 2010, helping vulnerable people feel safe and to help themselves. 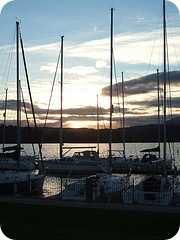 Last Saturday morning I had the pleasure of presenting at this year’s CILIP PPRG Conference being held in the Lake District overlooking Lake Windermere. The conference theme for this year was Marketing Gold — promoting libraries using data & web technologies. 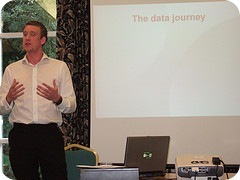 So on the final morning of the conference I gave my presentation on using technology to get the most out of your data. I discussed the use of data and database marketing in an integrated marketing strategy, and provided live demos on some of the technology we use at Talis, and how that could be beneficial for libraries to adopt. The technology that seemed to catch the eye was our email client, VerticalResponse, and how it can be used to track users’ email consumption habits. During the other sessions, it was great to see what libraries are doing already with their data to model users/potential users and provide a marketing strategy tailored to them. Nick London from Nottinghamshire Libraries gave an extremely useful presentation discussing (amongst other things) the Mosaic geodemographic data that they have been using to profile users and feed into marketing strategy. Both Nick and I showed the VizLib Project that Leicestershire Libraries have been working on – visualising library authority usage data. Worth a look if you haven’t seen it already. Other technologies mentioned over the conference that you may find useful to aid your library marketing were Google Analytics, Wordle, Tweetdeck, and Facebook Insights. As an aside, congratulations to both Durham University Library and Stirling Libraries on their PPRG Marketing Excellence awards announced at the conference. 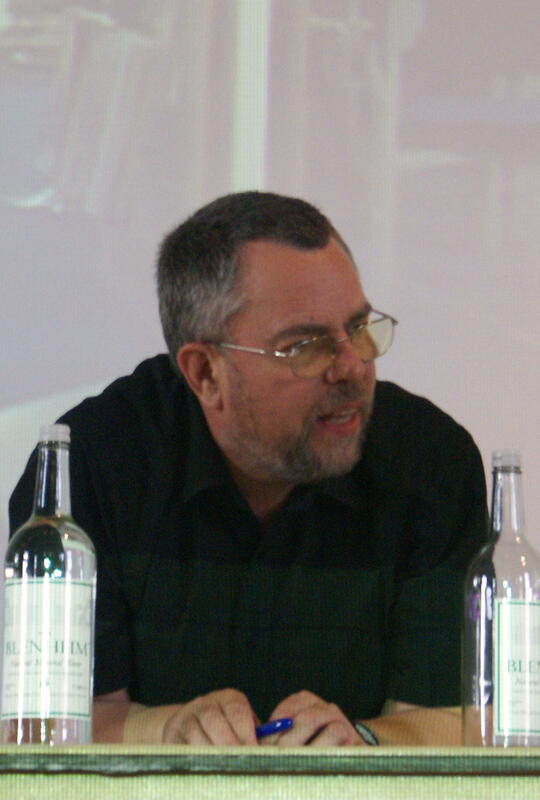 Pictures courtesy of CILIP PPRG on Flickr. It almost seemed like fate that the first day of the PLA conference, known for being addressed by the incumbent Minister for Culture, was also on the same day as the Comprehensive Spending Review announcement. Libraries have been in the limelight recently, not always positively, about what will happen when public sector spending is cut, and the speech by the current Minister for Culture, Ed Vaizey, was much anticipated. To the dismay of the delegates it was announced that he wouldn’t be attending to deliver his speech, but would instead be on video link from London. So after the morning coffee break, we all gathered in the main hall to hear Vaizey’s speech. Unfortunately the line wasn’t great but the Minister reaffirmed the value of libraries, and reiterated that the next few years would be tough. He said that libraries have a huge future and a very important role to play in society. For those in the audience waiting for a big announcement, it didn’t come. Although the Minister didn’t really say anything new it was encouraging to hear that the future of the public library service is safe and the 1964 Act wouldn’t be repealed. It was good to hear from the new CEO of CILIP, Annie Mauger, on day two of the conference. The view from CILIP is that now is the time to make libraries, and the library service, more visible. They have said that they will continue to campaign and advocate all libraries, and ensure that the need for professional librarians is maintained. Annie also revealed the CILIP policy on volunteers and gave a mention to the ‘what makes a good library service’ manual. The underlying message throughout the conference was that times are going to be hard. The comprehensive spending review made official what a lot of people already knew – budgets are going to be cut and the age of austerity has begun. In her closing address Kate Millin, conference chair, said that as long as good practice is shared and close working relationships are formed between libraries, partners and suppliers, then libraries will be well equipped to see through the tough times ahead.